K just loves to read. Thank you, thank you, thank you to Lindamood Bell! The downside of her loving to read is that she never wants me to read to her any more. I really miss it. She always thanks me for asking but says she would rather read to herself. K is going to a writing skills camp for the next couple of weeks at the Speech School. She came out today with a big grin and a thumbs up. She is going to have a language evaluation this week to get a baseline of her language development. She is also going to start language therapy and Fast Forward, a program that develops brain processing efficiency through intensive adaptive exercises. I truely believe that I cannot take a wait and see approach with K and I must do as much intervention as possible. One of the best books that I have read that discusses this is Adoption Parenting, Creating a Toolbox, Building Connections, by Jean MacLeod and Sheena Macrae. We will still have plenty of time for fun this summer. 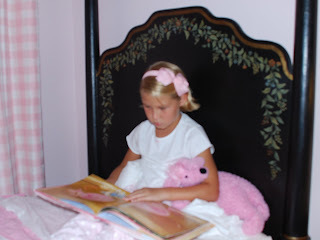 And, yes, K wears her bow until just before she goes to sleep. Hi I am currently taking my daughter to Lindamood Bell and what concerns me about your comments is that you required ongoing therapy. For example we have already completed fastforword and I was hoping after LMB we would not require ongoing therapy if K can read what else do you need?